Rhea Bentley has been employed with the University of Georgia Cooperative Extension for over 12 years. She is a County Extension Agent in Muscogee County where she supervises the Expanded Food and Nutrition Education Program. 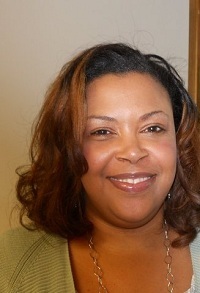 She received her Bachelor of Science in Home Economics Education from Tuskegee University and a Masters of Education in Family Education from the University of Minnesota.Prior to joining the Cooperative Extension, Rhea taught High school and Middle School Family and Consumer Sciences. Rhea has been a member of NEAFCS for 12 years. She has been actively involved in the association. Rhea has served on the NEAFCS board, previously. She held the office of Vice President for Professional Development. Rhea is passionate about her job and loves to talk about Nutrition. In her free time, Rhea enjoys cooking, shopping and traveling.